Partner Thomas I. Ross has been selected as a Fellow of the Litigation Counsel of America (LCA). Mr. Ross has litigated successfully in district courts throughout the United States and in the International Trade Commission (ITC) on matters involving patents, trademarks, copyrights, and trade secrets. 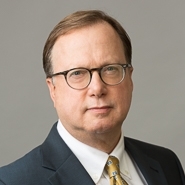 He has first-chaired numerous trials, both bench and jury, and has been the lead attorney on a number of appeals before the Federal Circuit Court of Appeals and other Circuit Courts. His skills derive from his work as an examiner at the U.S. Patent and Trademark Office, as a law clerk at the Patent Office Board of Patent Appeals and Interferences, as well as through his training in mechanical engineering. A graduate in mechanical engineering from Purdue University, he earned his Juris Doctor degree from Georgetown University Law Center in 1979. The LCA is a trial lawyer honorary society composed of less than one-half of one percent of American lawyers. Fellowship in the LCA is highly selective and by invitation only. Fellows are selected based upon excellence and accomplishment in litigation, both at the trial and appellate levels, and superior ethical reputation. The LCA is aggressively diverse in its composition. Established as a trial and appellate lawyer honorary society reflecting the American bar in the twenty-first century, the LCA represents the best in law among its membership. The number of Fellowships has been kept at an exclusive limit by design, allowing qualifications, diversity and inclusion to align effectively, with recognition of excellence in litigation across all segments of the bar.